Review by AllTheBestFights.com: 2018-10-20, Francisco Rodriguez Jr vs Hernan Marquez gets three stars only thanks to the good finish. The former Wbo and Ibf minimumweight champion Francisco Rodriguez Jr entered this fight with a pro record of 28-4-1 (20 knockouts) and he is ranked as the No.18 super flyweight in the world. ‘Chihuas’ Rodriguez lost to Moises Fuentes in 2015 (Rodriguez vs Fuentes) but since then he has won nine consecutive bouts beating Pablo Carrillo (Francisco Rodriguez Jr vs Pablo Carrillo) and Yohei Tobe in 2018 (Francisco Rodriguez Jr vs Yohei Tobe). His opponent, the former Wba Flw champ Hernan Marquez, has an official boxing record of 43-9-2 (30 knockouts) and he entered as the No.97 bantamweight but he comes off the loss against Jose Briegel Quirino. 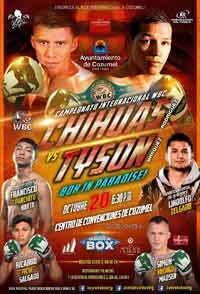 He had already faced and tied against Quirino at the beginning of 2017 and, before their second clash, Tyson Marquez had defeated Eduardo Hernandez and Jesus Beltran. Rodriguez vs Marquez is valid for the WBC Latino Silver super flyweight title. Watch the video and rate this fight!